May has a solid list - plenty to be excited about here! 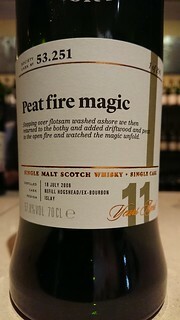 The theme is Islay versus Speyside, and both regions put in solid appearances. Speyside won for me - I preferred the cracking Mannochmore, which gets a deserved 5 out of 5. Sadly it's one bottle per member, so I can't have the number of bottles I'd like! Scoring 4.5 there's the cracking Glenburgie, which I very much enjoyed. There's also the excellent Miltonduff, the Benrinnes, the Linkwood, the very drinkable Glen Grant and the Glenrothes all scoring 4. 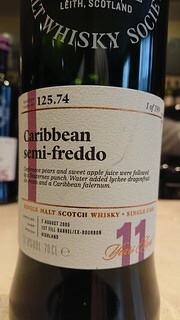 Outside the region fight, you should also definitely try the Croftengea, which was the other dram to score 5 on the list. With velvety smoothness and a wonderful set of flavours, this whisky is superb. It also gave me an excuse to write about Lomond stills, which I'd been intending to do for ages... There's also a superb Auchentoshan that really should be tried. That brings me to a quick note about scoring. I've grown concerned that people are getting obsessed with numbers. The score has always been a complex thing, but is intended to be more of a guideline. And it's based on (mostly) technical aspects of the whisky. But I do wonder if people aren't skipping some of the very drinkable 3's and 3.5's that I find. So from this month onwards, I'm adding a new second score - "Personal Preference". It's designed to say how much I preferred it, rather than what I thought about it. We've all had drams that were technical masterpieces - perhaps heavily influenced by cask or cereal - but that we could happily live the rest of our lives without ever drinking again. Just because something gets a full score, it doesn't mean I want a bottle. I struggled with how to express this, before falling back on the scoring system a friend uses, which goes like this: "Do I like it? Do I want a dram? Do I want another dram? Do I want a bottle? Do I want more than one bottle?" Based on that, I'm now adding whether I'm happy with just a dram, or whether I'd want another dram, a bottle, or... you get the picture. I don't think there's such a thing as a perfect scoring system - ultimately they all show some kind of bias - but the technical score tries hard to avoid it, whereas the personal preference is all about my taste. So witness the difference between the Benrinnes and the Linkwood this month - both scored 4, but I only want a bottle of one of them. The other, I'm happy to have another dram of but no more. I don't think you'd get that from the tasting notes - I wrote a lot more about the Benrinnes than the Linkwood. The January list is a strong one - a great start to 2018! There are three drams that score 4.5, and four that score 4. What's more, there's two sherried drams and three peated ones, plus an oily and coastal. Not a bad spread of whiskies! The highlights were the floral, fruity Glen Grant, the honeycomb, bread and ginger of the Strathclyde, and the ash and lemon of the Ledaig. I'm looking forward to drinking all of those again (and again, and again)! 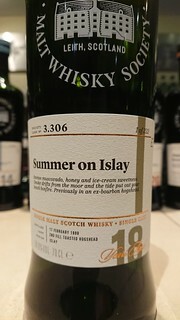 Also worth a try are the deep, fruity, bready Glentauchers and the sweet, oily, lemony and moreish Bunnahabhain, the lemon and oak of the Tormore and the crisp smoke and lemon sherbet of the Caol Ila. There are quite a few spicy drams on the list - and yet I feel I should note that the wonderfully named "Charge of the spice brigade" still scored a 3.5 and has a great set of accompanying flavours that help temper the spice. The Cragganmore and the Laphroaig were also pretty decent drams that I think are worth investigating. And sherry fans will adore the extremes of the Ben Nevis! Sadly the Ardmore (66.112) and the Balblair (70.23) are arriving late - so there will be one more update. I've enabled versioning on this page - you can see the initial summary from the preview here. It's the Christmas Parcels List! Annoyingly, some of the best drams are in the parcels. But 'twas ever thus with Christmas Parcels, so we shouldn't be surprised. The delicious citrus and spice Tullibardine and the fruity joy of the Glengoyne are superb, and if you like the rest of their parcels then they're well worth it! Otherwise, get to a bar and enjoy a dram or two! Outside the parcels, two drams jumped above the rest - the delightfully tropical Glenmorangie and the wonderfully rich Highland Park. Quite different in their styles, but both exemplary. There are, for the second list in a row, too many drams that scored four to list. A whopping sixteen! If you add those to the four mentioned above, that's 20 out of 29 with four or above - a highly respectable amount! OK, now you're just being silly. But it's very big. 43 whiskies big. And all of them manage to get to the London Rooms, which I'm pretty impressed by - well done whoever was doing the logistics! Of course, size doesn't automatically mean quality - but you don't have to worry there. 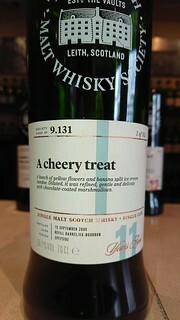 The SMWS has evidently been keeping a number of these hiding for a while! In terms of scores, there were TWENTY 4s, EIGHT 4.5s and a well deserved 5. That's more than half the list getting a great score! 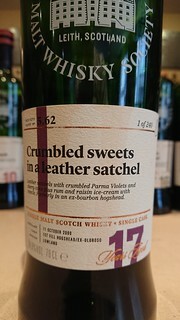 There's also some distilleries that we don't see very often at the SMWS, but I'd like to remind members that we should focus on the flavour not the provenance! 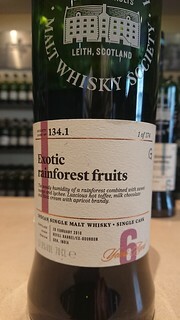 In the 4.5s, we have a superb floral and fruity Glen Moray, a finely balanced Mannochmore, an elegantly fruity Glenlivet, a sweet (in both senses!) Linkwood, a citric Aultmore, a wonderfully floral Glen Grant, a superbly smoky Highland Park and a heavily peated Bunnahabhain. I am not listing all twenty of the fours. I have a life to live. My recommendation is to get yourself to an SMWS bar, and start drinking. Many of these won't last long! It's that time of year again - the slog through the SMWS glut of whiskies before Christmas! This list is small - just twelve whiskies - but has a surprisingly high average score. In fact, nothing got below 3.5. Not even the spicy whiskies! Conversely, nothing got a 5 either. If we were hoping for the giddy heights of Outturn 257's Bladnoch, we're a little out of luck. But the Glen Grant, the Benrinnes and the Bunnahabhain all got a score of 4.5. 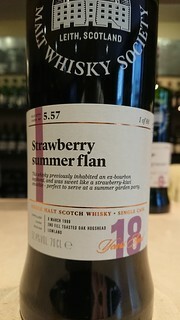 If I had to pick between them, I'd plump for the Glen Grant - its floral, fruity sweetness is very much my kind of dram. But the fruit and ginger of the Benrinnes is charmingly disarming, and the Bunnahabhain has a curious combination of citrus, ginger, smoke and pickled onion that can be filed under "shouldn't work but does". I can also recommend the Dailuaine, Aberlour, Linkwood, Laphroaig and Highland Park, as each scored 4. The Dailuaine and Aberlour are classic young refill bourbon casks, which will please many. The Linkwood is a fruity sherried bomb of flavour, and I suspect will be much in demand. The Laphroaig was nowhere near as TCP dominated as I'd feared, delivering a clean coastal hit of sweetness. 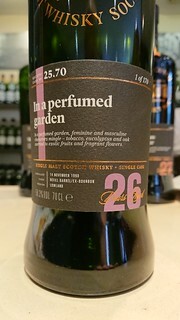 And the Highland Park is very peated - not what I'm looking for really, but it holds it all together very well to produce a fruit and smoke mix that will drive some people crazy. When looking to summarise this list I recalled reading recently that some Port producers have started returning a portion of their production to older, less efficient methods. The changes made over the years had created consistently high quality Port but there were fewer of the truly stellar, mind blowing casks. Someone finally realised that by removing the variance that created poorer casks, they'd also removed the possibility of the brilliant ones. This list feels like that. It's an excellent list - of very high quality. But there were fewer highs and lows than usual. A new distillery is a big event at the Scotch Malt Whisky Society. There's usually a mad scramble to get hold of bottles of the first release (.1), and much guessing at what the distillery is. This time is a little different. The release isn't part of a normal outturn, but was done mid-October by email and website. 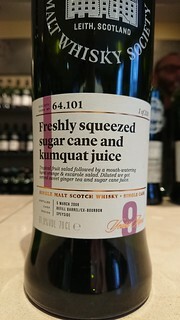 It seems an open secret that the distillery is Paul John, making this the SMWS's first Indian whisky. Bottles of the .1 release are available only by a ballot, which you enter by email. 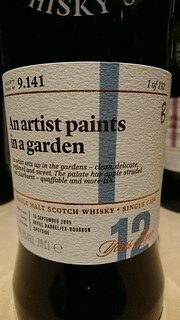 They've also put out a 134.2 release at the same time, and for the same price - so if you just want to try a bottling from the distillery and aren't fussed about nabbing the first one, you have a chance to do so. I can't see what more the SMWS could have done to try and make this fair - I like this way of working, and I hope it works well for them. But what about the whiskies? Well, they're both good. That's no surprise - Paul John is an excellent distillery. Personally I think I preferred the 134.2, but it's a close run thing. Both score a very solid 4, and I was nudging up against a 4.5 score for each - but they lacked that certain something that's hard to define. They were very spirituous, rewarding the patient drinker who's willing to let the whisky sit. And let's be clear - a 4 is not a bad score. Get to the rooms and try these bottles before they're gone!